Thursday is one of my favorite sports days of the year: the NBA's trade deadline, which is at 3 p.m. ET. The league moved up the deadline this year ahead of the All-Star Game partly because of the DeMarcus Cousins embarrassment last season when it became known that he had been traded during that game to New Orleans, which just so happened to be hosting the All-Star Game. One benefit of the earlier deadline is that it gives traded players a bit more time to acclimate themselves to their new teams. I think it's a sure thing that Memphis' Tyreke Evans is dealt by 3 p.m. ET Thursday if not by the time you read this. I thought there was a good chance the Clippers would trade high on Lou Williams, but now reportedly the sides have agreed on an extension. Not sure what that might mean for Clips center DeAndre Jordan, who was seen as likely the biggest name to be dealt Thursday. Needless to say, any major deals could affect the lines for some of Thursday night's games. Jordan could affect a few teams' futures odds. Both these teams are open for business ahead of the deadline - Aaron Gordon reportedly is being made available by the Magic as they retool yet again. He remains out with a hip injury, which all but kills his trade value. The Magic have won back-to-back games for the first time since early November following a stunning 116-98 comeback home victory vs. Cleveland on Tuesday. The Cavs led by 21, but Orlando's Jonathon Simmons scored 22 of his career-high 34 points in the third quarter. The Magic made their first 10 shots of the second half. The Hawks won their second straight Tuesday, 108-82 over Memphis. Atlanta shouldn't be beating anyone by 26 points. Hawks 3-point specialist Marco Belinelli was held out as the team discussed a possible trade. He's almost surely a goner but won't bring back much of anything. Orlando and Atlanta have split two meetings this season, each winning at home. 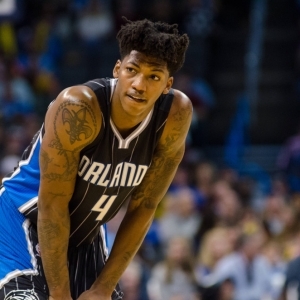 Key trends: The Magic are 8-1 against the spread in their past nine vs. the East. The "over/under" is 5-0 in Atlanta's past five vs. teams with a losing record. Early lean: This is TBA not for Gordon but Simmons (ankle) and Nikola Vucevic, who are both questionable. Vucevic hasn't played since Dec. 23 due to a broken hand but obviously is close. Probably nothing to see here trade-wise. Normally, I would have led this story with Kristaps Porzingis tearing his ACL in Tuesday's loss to the Bucks, but I need time to process that. Hate the Knicks, but the Unicorn was so fun to watch. Not sure it means much this season as New York wasn't going to make the playoffs, but now Porzingis probably misses the first few months of next season, which is a total bummer. The 103-89 defeat was New York's fourth straight. To make matters worse, Tim Hardaway Jr. tweaked his troublesome leg so he's probably out a while. The Raptors won their third in a row Tuesday, 111-91 over Boston. Kyle Lowry led with 23 points. This now has the potential to be a letdown game. These teams have split two meetings this season, and Toronto has won the past four at home. Key trends: The home team is 6-1 ATS in the past seven meetings. The under has hit in five straight Knicks games vs. the East. Early lean: I'd bet against the Knicks for a while. This is TBA for Hardaway Jr. and Enes Kanter (oral surgery) as both are questionable. First TNT game. Washington is looking into Jordan, while the Celtics' signing of Greg Monroe might be all they do. Boston's four-game winning streak was snapped Tuesday in a 111-91 loss in Toronto. Kyrie Irving was back after missing three games due to injury but played only 22 minutes and had 17 points. Al Horford had just two. The Wizards had been 5-0 since John Wall went out, but they lost in Philadelphia on Tuesday in the second of a back-to-back, 115-102. Bradley Beal had 30 points. Washington won the first meeting this season vs. Boston, 111-103, on Christmas at TD Garden. Beal had a game-high of 25 points to go along with eight rebounds, while Wall added a double-double with 21 points and 14 assists. The Wiz also have won the past two at home in the series. Key trends: The home team has covered 10 of the past 12 meetings. The over is 4-1 in the previous five. Kemba Walker is expected to stay in Charlotte. I have seen some rumors of the Blazers dealing CJ McCollum, but that's not likely. Maybe in the offseason both guards are on the move. The Hornets lost a third consecutive game Monday, 121-104 in Denver in the second of a back-to-back. The Nuggets hit 56.8 percent from the field, the fifth straight opponent to shoot better than 50 percent against the Hornets. Marvin Williams missed his fourth straight game with a sprained left ankle but has a good shot of returning here. The Blazers dropped a third in a row on Monday (all on the road), 111-91 in Detroit. Portland was without Evan Turner because of a left calf injury. Portland won in Charlotte on Dec. 16, 93-91. McCollum led Portland with 25 points, while former Blazer Nicolas Batum paced Charlotte with 23 points. Key trends: The Hornets have covered just one of their past nine in Portland. The over is 5-1 in the Blazers' past six at home. The Warriors can just sit back and smile as other teams try to close the gap on them. I expect an angry bunch here, though, as the Dubs never led in a 125-105 home loss to the Thunder on Tuesday - Golden State's first back-to-back defeats this season. The Warriors also lost for the first time in seven games when taking on an opponent that had previously beaten them this season. Finally, it was the first time since April 2012 that the team never held a lead in a home game. Draymond Green was ejected with 8:13 remaining after a second technical. Dallas lost at the Clippers on Monday, 104-101, allowing the final 13 points of the game. Dirk Nowitzki became the sixth player in NBA history to reach 50,000 career minutes. Harrison Barnes was held out with a sore left ankle. The Warriors have won nine straight and 16 of the last 17 regular-season meetings with the Mavericks. Dallas hasn't won in Oakland since April 2012. Key trends: The Mavs are 2-6 ATS in their past eight in Oakland. The under is 4-1 in the Warriors' past five. Early lean: TBA for Barnes -- Warriors will absolutely crush the Mavs. Second TNT game. OKC is looking for wing help after losing Andre Roberson for the season. The Lakers would trade Jordan Clarkson and/or Julius Randle. This sure seems like a letdown game for the Thunder after that very impressive win in Oakland on Tuesday that snapped a four-game losing streak. Russell Westbrook and Paul George combined for 72 points. Carmelo Anthony left early with a sprained ankle. The Lakers won a third in a row Tuesday, 112-93 over Phoenix. Brandon Ingram scored 26 points for the Lakers, while Randle added 21 points, eight rebounds and five assists. We will go an entire season not seeing L.A. natives Westbrook and Lonzo Ball share the court in this matchup as Ball has missed all three due to injury and will be out again here. The Thunder won the first two in blowouts but lost at home on Sunday, 108-104. The Lakers had lost 11 straight in Oklahoma City. Key trends: The home team has covered 15 of the past 19 in the series. The over is 5-1 in the previous six in L.A. Early lean: I really don't think Melo should be a TBA reason any longer. I love the Lakers here regardless.